Seabird Mortality Rises on Pacific West Coast – Neptune 911! Small seabirds are washing up dead on local beaches, an unusual phenomenon that suggests high ocean temperatures are causing starvation. 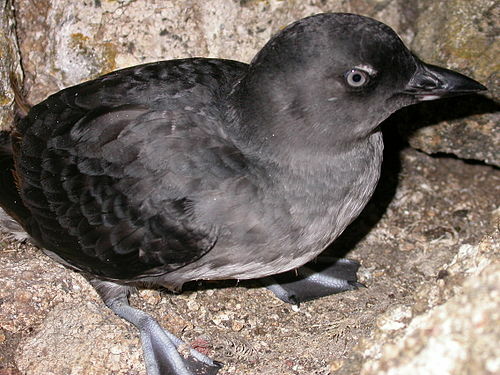 The hardy gray birds, called Cassin’s auklets, are rarely sighted in offshore waters. They normally live in the distant open ocean, feeding on small crustaceans in the cold Pacific Ocean. But this month, large numbers of thin, dying or dead birds are being seen along our coast. Most reports come from San Mateo County beaches, such as Pescadero’s Gazos Creek and Pacifica’s Linda Mar. Bodies also have been found on the coasts of Marin and Sonoma counties. A preliminary analysis of the bodies of five young birds by the National Wildlife Health Center concluded that they were in poor or emaciated body conditions, “consistent with a lack of zooplankton,” according to Beach Watch, a monitoring project of the Farallones Marine Sanctuary Association, which found and submitted the birds. “This bird seemed sort of listless and didn’t react in any way,” said Kossy, a board member of the San Mateo Resource Conservation District. It was an unusual sighting, and she kept her distance. Calling the phenomenon “an unusual mortality event,” the Farallones Marine Sanctuary Association is working with state and federal agencies as well as local researchers to document the event and try to determine its scope and cause. Seabirds like auklets are “indicator species” of the overall health of the marine ecosystem just off our shore, according to the association, which protects the wildlife and habitats of the Gulf of the Farallones, located off the Golden Gate. After an early November storm off the Pacific Northwest coast, bird bodies were scattered along beaches’ wrack line, according to the Chinook Observer, a newspaper in Washington state. Like the California birds, they were youngsters who hatched this spring. Rare changes in wind patterns this fall have caused the Pacific Ocean off our coast to warm to historic levels, according to scientists. In mid-October, it was 65 degrees off the Farallon Islands and in Monterey Bay; in most years, water temperatures in those areas would be in the high 50s or low 60s. That’s because winds aren’t pushing away warm surface water and churning up cold water from down below, a seasonal process called upwelling. The warm water is linked to other unusual sea sightings. Southern species such as the common dolphin, Guadalupe fur seal and even the endangered sea turtle have been observed off the Northern California coast. The stalled ocean upwelling means that tiny zooplankton, like krill, are not arising from cold depths. A shortage of zooplankton was detected during research tests in September by a ship with the Applied California Current Ecosystem Studies. That’s tough for seabirds like auklets, which only eat zooplankton. Additional testing is needed to confirm that is what is killing them, according to the Farallones Marine Sanctuary Association. Scientists want to rule out other possible causes of death, such as bacterial or viral disease. If confirmed, “They would be the first seabird species hit hard by a lack of krill.” the association said.